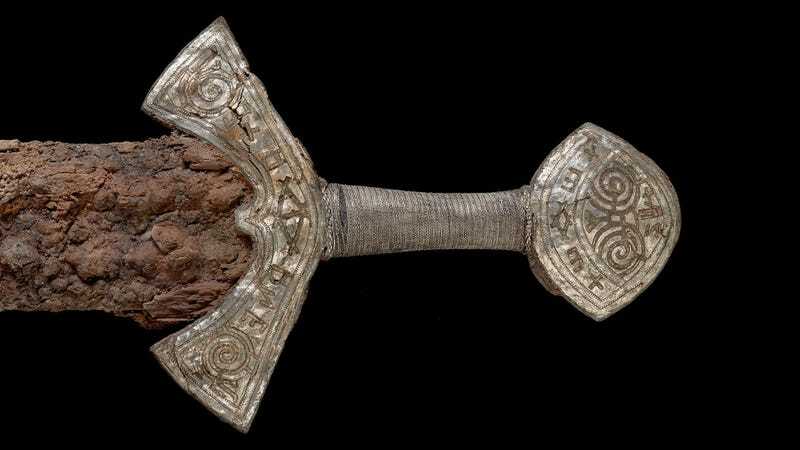 For the first time since its discovery in 2011, this ornate 1,000-year-old Viking sword is being shown to the public. Dating back to the final days of the Vikings, it has been linked to battles in England. The sword was found alongside a corpse in a Langeid grave in the Setesdal Valley four years ago. It’s now on display at the Museum of Cultural History in Norway as part of the “Take it Personally” exhibition. The sword, which measures 37-inches (94 cm) long, features a rusted blade, but the handle is very well preserved. It’s wrapped with silver thread, and the hilt and pommel at the top are covered in silver with details in gold, edged with a copper alloy thread. Closer examination of the sword also revealed remnants of wood and leather on the blade — likely the remnants of a sheath that housed the sword. It also features decorations of large spirals and combinations of letters and cross-like ornamentation. The letters are probably Latin, but the meaning remains a mystery. Indeed, it was around this time that Viking king of Denmark Sweyn and his son Canute led their armies in a series of battles against King Ethelred II of England. Another possibility is that his father, Arnstein, had his son’s magnificent weapons returned for precisely that reason, and decided to erect a runic stone for his dead son as a substitute for a grave.